The usefulness of airships and blimps really need to be discovered again. Sad to say, the inter-war flying behemoths were plagued by bad press and catastrophic accidents that doomed them to obsolescence. Several generations since, the only remaining impression of airships likely stems from a scene in Indiana Jones and the Last Crusade. How unfortunate. Jack Clemens begs to differ. After years of toil, Clemens has finally unveiled his years long DIY project to huge acclaim. He might not have become a TV star overnight, but his inspiring tale is going the rounds across the interwebs. A retired computer engineer, Clemens’ all consuming passion for building a scale model of a legendary airship stemmed from constantly passing by the hangar of the USS Macon. 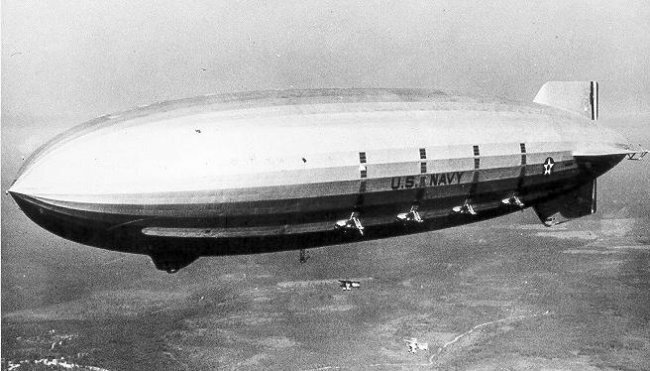 The USS Macon (pictured above) was in service before World War 2 and was unfortunately destroyed in a freak weather incident. In a years long odyssey that was part tribute and part challenge, Jack Clemens assembled the exquisitely detailed model for several years. After huge setbacks—his cat jumped on the hull, destroying it—and iron hard persistence, Clemens has achieved his lofty goal. In his garage right now sits a remote controlled 20 foot replica of the USS Macon. Clemens says he might donate it to a museum someday.